Now the expectation, the Women’s Premier League did not disappoint in its level of drama. The Blue Conference produced a tie and five-point decision, while the Red Conference victors reorganized the standings once again. There was only one Saturday game this round, and San Diego traveled to Glendale for a top-of-the-table rematch. San Diego scrumhalf Liz Trujillo scored five minutes into the game, and inside center Megan Foster, back from the USA Falcons’ trip to Hokkaido, Japan, kicked the first of her four conversions. Glendale flyhalf Hannah Stolba got the home side on the board minutes later with a penalty, and then Foster scored a try, conversion and penalty to give the Surfers a 17-3 halftime lead. Glendale surged in the third quarter, putting wing Nichole Wanamaker away for two tries and reserve prop Maya Learned for a third. Stolba converted all three for the 24-17 lead. The Surfers then regrouped and regained the lead as No. 8 Kate Zackary and wing Tiffany Tate dotted down, 31-24 with Foster’s conversions and approximately 10 minutes to go. 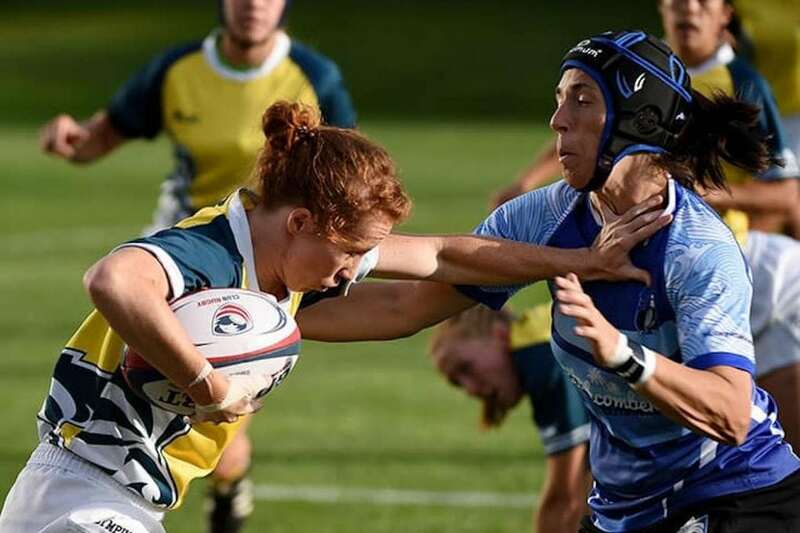 In the waning minutes, reserve Matelina Maluia was yellow carded, and the Merlins made good on the advantage, as Wanamaker scored her third try. The crucial conversion from Stolba fell over, and there the game ended: 31-31. On the other side of the bracket, Berkeley was back on the road for a fourth-straight game and looking to snap a two-game losing streak. But ORSU honed the momentum early on and 10 minutes in put flanker Rachel Johnson away for the opening try, 5-0. Inside center Bulou Mataitoga scored two tries and added a conversion, and prop Elena Edwards dotted down. ORSU scored through prop Adrienne Acosta, and flyhalf Karissa Postula’s conversion produced a 17-12 lead to Berkeley at the break. The exchanges continued into the second half, and the teams actually went try for try. Berkeley’s three scores came from Reddick (2) and flyhalf Evan Hoese, and scrumhalf Shelby Lin added conversions. ORSU put Johnson, No. 8 Te Awhina Ho Chee and lock Gabrielle Dixson into the try zone, and Postula handled the extras, 36-31 the final. In the Red Conference, Twin Cities entered the weekend in third place and traveled to second-place Beantown. The teams tied when they played in Minnesota, and during the first half of Sunday’s game, both scored two tries. Yeja Dunn and Miranda Wakimoto scored for Beantown, and Twin Cities put lock Shaena Sparrow and outside center Kelsey Coley in for five apiece. Beantown center Tatjana Toeldte converted, and Twin Cities fullback Megan Wolff went 2-2 for a 14-12 lead at the break. During the next 30 minutes, Twin Cities averaged a try every 10 minutes, as No. 8 Katie Johnson, scrumhalf Rachel Lentsch and flyhalf Katana Howard scored. Then, in the final 10 minutes, wing Kaelene Lundstrum and Lentsch (2) matched the try count, and Wolff added another four conversions for the 52-12 win. The New York vs. Atlanta game was the highest-scoring affair of the weekend, and it wasn’t until the fourth quarter that New York really pulled away for the 58-32 win. The victory came at the right time for the defending champion. New York and former head coach Andrew Britt parted ways, and Tiff Faaee and Lucia Oswald stepped in as coaching staff. There’s a lot of trust and knowledge in this leadership, and it helped right New York for the second half of the season. “We knew how important it was to win this game and came in with the mentality that we have each other’s backs and that losing was not an option,” Salomon said. After a tight first half, New York settled into a faster game, which rested on the forwards’ ability to maintain possession through multiple phases. Fast ball made its way through the backs’ hands – something that had been lacking in previous games – and well worked, sideline-to-sideline tries followed. IN the final 15 minutes, New York scored four tries for the 26-point win.